New for 2011 are the HMAF Talking Figures. There’s the Army Talking Infantryman, the Navy Talking Hawk Eyes Commando, and the RAF Talking Police Dog Handler. All three have the new MTP (Multi-Terrain Pattern) camouflage uniform developed by HM Armed Forces for use in the varying terrain of Afghanistan and coming into wider use in 2011. These HMAF figures have the welcome new addition of a talking feature; press the stomach to hear combat sound effects and phrases, a modern iteration of the 70’s pull-cord talking Action Man figures. 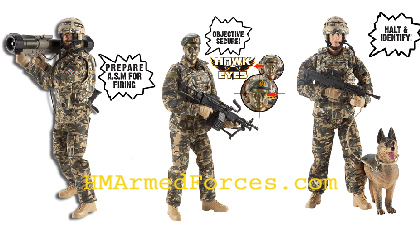 What’s more the Talking Infantryman comes with the newly developed British Army Anti Structures Munition. The Talking Commando has face camouflage, hawk eyes and thermal imaging binoculars. And the RAF HMAF Talking Police Dog Handler comes with an alsatian dog and leash. 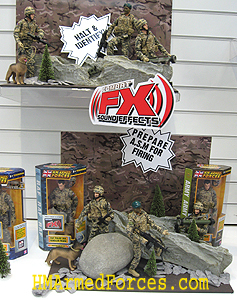 The Talking HMAF Figures are available from January 2011.